Just a short stroll from the famous Cable beach you will find The Pearle Resort. A newly built resort designed to take advantage of prevailing breezes and set in a lush tropical setting. The resort features 35 fully serviced guest rooms and also 'The Pearle Pavilions'. 35 5 star equivalent, architecturally designed pavilions, each with their very own private swimming pool! These are One of Western Australia’s finest self contained accommodation options in one of the Australia’s most unique locations. Located just 15 minutes walk to the world famous Cable Beach, and 5 km from Broome town and the airport, The Pearle features a seasonal café that overlooks a 25 metre infinity pool with resort style surroundings. Let us organise your daily tours while you wait in the guest day lounge. 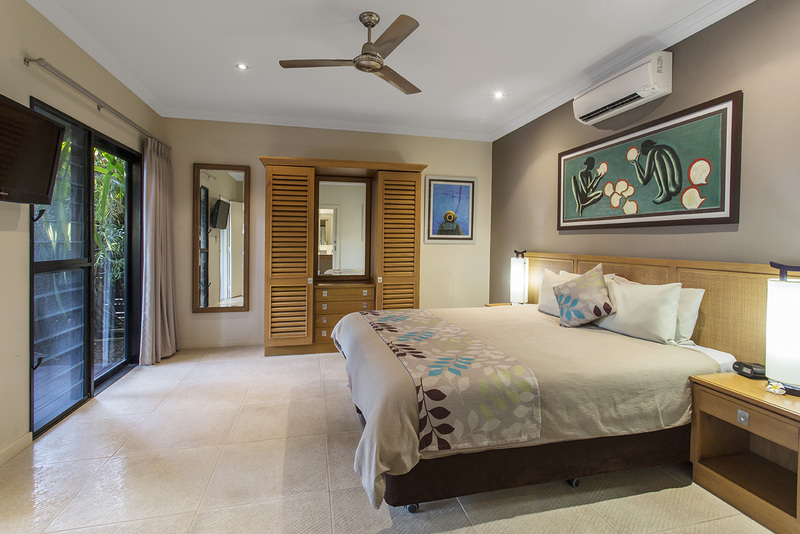 Guest rooms- fantastic for that short stay in Cable Beach. Serviced daily. King bed, balcony, lcd tv with 10 free Foxtel channels. Fridge and large bathroom with walk in shower. Pearle Pavilions- More like a luxury residence than an accommodation room. These rooms are perfect for that medium to longer stay, featuring over 200m2 of modern private space, furnished and fitted with the highest of standards. 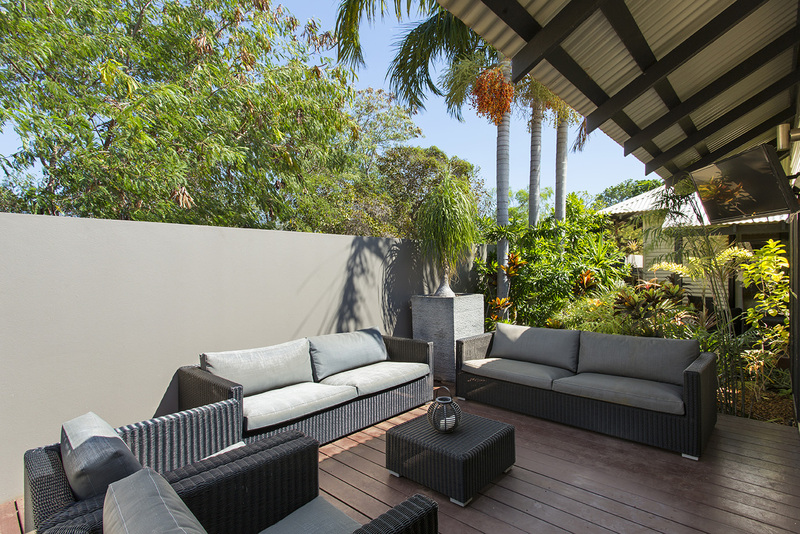 Private decks and private courtyard with high grade stainless BBq. Option of 1, 2 or three bedrooms all with their own ensuite, reverse cycle aircon. , ceiling fans, and all with their own lcd tv. 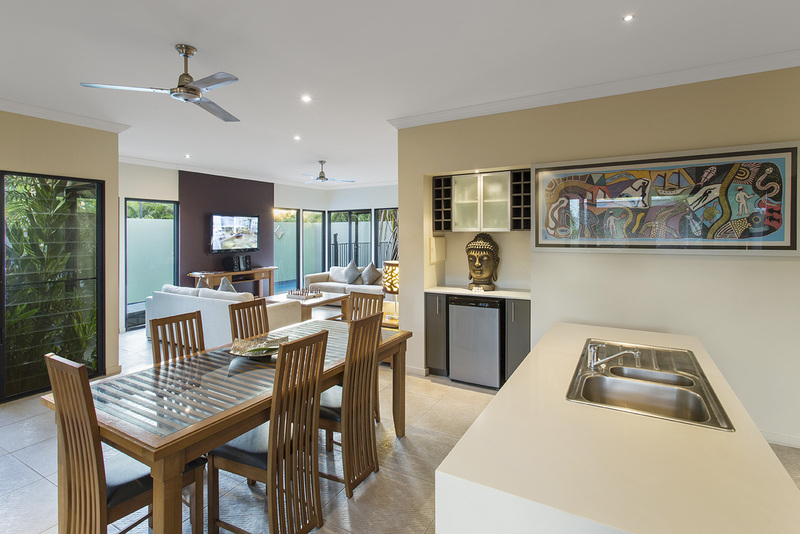 The main living area has 42 inch plaza screen with 10 free Foxtel channels. Full kitchen and laundry facilities and even its own bar area with separate fridge. The ‘wow’ factor of these pavilions is that they each feature their very own 8 m swimming pool. Perfect for that dip after a day exploring. Serviced Guest Rooms (4 .5 star equivelent) as well as 1, 2 & 3 Bedroom 5 star equivilent Self Contained Pavilions. The Pearle Pavilions are self rated 5 stars and have stainless steel appliances, stone bench tops, air-conditioning, LCD TVs in all rooms, DVD/CD stereo, 10 Free foxtel channels, spacious living areas, private alfresco dining on outdoor timber decks with stainless steel barbecues and private lap pool with sun decks and sun lounges. Guest Rooms are serviced daily and have LCD TV and 10 Free Foxtel channels, Bar Fridge, Tea and Coffee making facilities, King or Singles, Air Cond, large ensuite bathroom with walk in dual shower, Small Timber Balcony with outdoor seating. Travel along Broome Rd. Turn left at Fairway Drive. Turn left onto Lullfitz Drive. Turn left onto Millington Road. The Pearle Resort is on your left hand side - 14 Millington Road, Cable Beach Broome. Stay 7 nights and receive major discounts ! BROOMES FINEST! NEW RESORT! LUXURY! YOUR OWN PRIVATE SWIMMING POOL w/sunlounges & decks. Fully Self Cont. King bed, large ensuite with walk in dual showers. Alfresco dining with private courtyard and BBQ area, Laundry. LCD TVs in bedroom & lounge. 10 FREE Foxtel. (Tariff shown includes discounts). Cot and High Chair available $30 per night each. Let us help organise any tours or car hire. YOUR OWN PRIVATE SWIMMING POOL w/sun lounges & decks. Fully Self Cont. King bed, large ensuite with rain showers. Alfresco dining with private courtyard and BBQ area, Laundry. LCD TVs in bedroom & lounge. 10 FREE Foxtel. (Tariff shown includes discounts). YOUR OWN PRIVATE SWIMMING POOL w/sunlounges & decks. Fully Self Cont. King bed, large ensuite with rain showers. Alfresco dining with private courtyard and BBQ area, Laundry. LCD TVs in bedroom & lounge. 10 FREE Foxtel. (Tariff shown includes discounts). YOUR OWN PRIVATE SWIMMING POOL w/sunlounges & decks. Fully Self Cont. King beds or option to 1 king bed and 2 king singles, large ensuites with walk in rain showers. Alfresco dining with private courtyard and BBQ area, Laundry. LCD TVs in bedroom & lounge. 10 FREE Foxtel. (Tariff shown includes discounts). YOUR OWN PRIVATE SWIMMING POOL w/sunlounges & decks. Fully Self Cont. King beds or king singles, large ensuites with rain showers. Alfresco dining with private courtyard and BBQ area, Laundry. LCD TVs in bedroom & lounge. 10 FREE Foxtel. (Tariff shown includes discounts). 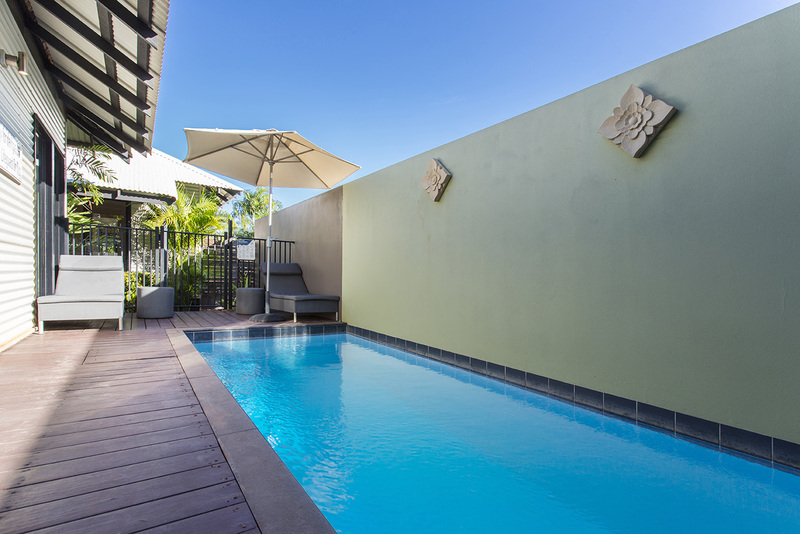 YOUR OWN PRIVATE SWIMMING POOL w/sun lounges & decks. Fully Self Cont. King beds or king singles, large ensuites with rain showers. Alfresco dining with private courtyard and BBQ area, Laundry. LCD TVs in bedroom & lounge. 10 FREE Foxtel. (Tariff shown includes discounts). 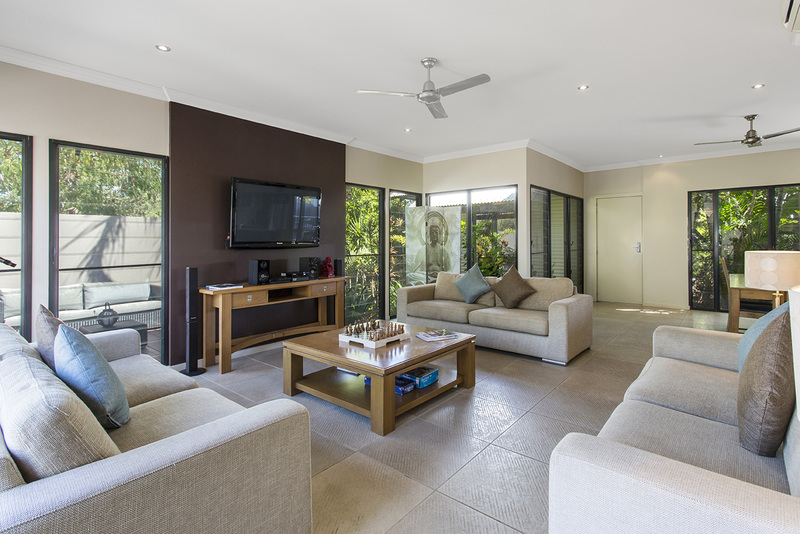 Fantastic for that short stay in Broome! Guest Rooms serviced daily and are Open Plan with King Bed or King Singles, Large ensuite with walk in rain shower, Tea and Coffee making facilities, Bar Fridge, Air-Conditioning with LCD & TV w/ 10 free Foxtel channels. Timber deck with outdoor setting. Guest Room is 30m2. Sleep maximum 2 people. No extra persons allowed except infants. Cots or high chairs available at extra $30 per night each. Stay minimum of 3 nights and receive a substancial discount off rack rate! 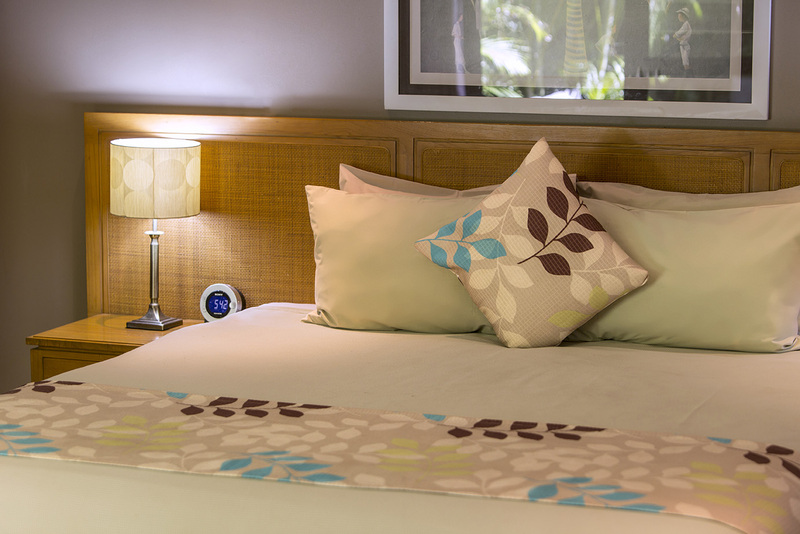 Fantastic for that short stay in Cable Beach. Serviced daily. King bed, balcony, lcd tv with 10 free Foxtel channels. Fridge and large bathroom with walk in shower. Free use of resorts 25m infinity Pool. King Bed or 2 singles. Cot and High chair available Extra $30 per night each. The Pearle requests that full payment be processed at the time of booking. No refunds apply to bookings.